I will describe a process that, if applied consistently, will greatly reduce this behavior. I believe it will have good results in the short term, and in the long term, the results will be profound. But it will take time, patience and consistency! You cannot be in a hurry each time this process takes place. In a very calm, controlled, yet firm voice I say, “You will not tell daddy ‘no’. You will say ‘yes, daddy’ and you will obey.” Then I show him exactly how to say it, “Yes, daddy” and I expect him to repeat it. I calmly say, “then you will have a time out.” I pick him up, take him to a corner and set a timer for 3 minutes (1 minute for each year old of the child). If I have to hold him in the corner for the entire three minutes I will. But I will not say a word for this three minutes, I let the consequences do the teaching at this point. Then I say in a very calm and positive tone, “It’s time to pick up toys.” And again I model the appropriate response out loud, “Yes, daddy” and I expect him to repeat it and obey. He has a choice at this point: obey or not. He screams back “NO!” I do the same thing again. I say, “You will not tell daddy ‘no’. You will say ‘yes, daddy’ and you will obey.” Three minutes on the clock. If I have to hold him in the corner I do. But there is no talking, no yelling, no anger, no arguing, I am completely silent. Each time this interaction takes place the child has a choice. He can say “yes, daddy” and pick up the toys, or he can get another time out. If you use spanking, this could be added to the process (we will talk more on this later). You continue this process until he obeys. You must be in control of your own emotions. You are modeling that for him every step of the way. Don’t get angry, let the discipline speak for itself. This process MUST be repeated until the goal is achieved. If it takes an hour, it takes an hour. If it takes two hours, so be it. The child must learn that you are in control. You are teaching self control. It is one of the greatest gifts you can give your child.You are on his side. He is wrestling with his own disobedience and you are his greatest ally in this battle against wrong choices. You are not mad at him, you are on his team helping him conquer his tendency to disobey. Each time you model for him the appropriate response, “yes, daddy.” This is important. When the episode is over, it is over. All is forgiven and you can ‘love on him’! Don’t bring it up again. Don’t say, “Why couldn’t you have done it the first time” (more on this later). Next week: Step 3: Put the tension where it belongs. If anger is a result of unmet expectations, then perhaps we would do well to take a good look at our expectations. (This principle can be applied to marriage, work, friendship … any area of life, really.) If my goal and expectation is for my 5 year old to always share his toys and never hit, I will be sorely disappointed. If expect him to need discipline, and I am prepared and ready to administer the discipline, and my goal is for him to learn to obey only after a long process of teaching, then this is a reasonable goal. Next week: Being prepared for discipline and putting the tension where it belongs. … and it is us. The greatest barrier to teaching our kids self control is … yup, you and me. Over dinner we say, “You will never believe what my stupid supervisor did today …” Behind the wheel we say, “Hey idiot, get out of my way!” Then later, “That cop was such a jerk to give me that ticket!” What about when you don’t want the phone call, “Tell him I’m not home.” Our kids have just picked up our practices concerning four very important areas of life: submission to authority, patience with others, obeying the law and honesty. Our attitude toward our boss, will become their attitude toward us! Our level of patience, will become their ability to be patient with those around them. If we don’t obey the laws of the land, why would we expect them to obey the rules of the house? And if we allow dishonesty to come from our lips, why are we surprised when they lie to us? Now here’s the real kicker … we lose our temper with our kids. We allow anger to get the best of us and we yell and engage in battle with one of our children. The problem here is, we have just taught the child how to lose their temper when faced with a difficult situation. On top of that, anger shows the child that the parent is not in control of the situation and not in control of himself, thus the child loses respect for the parent. Do you respect people in authority over you who cannot control their own emotions and anger? Next time … how do we take the anger out of discipline? Think about it … the skill of self-control is foundational for all other moral behavior. Your toddler has been told countless times not to take the toy from the other child, but still does it. When it is taken back by force, she knows not to hit, but she does anyway. She has been taught to stay in her bed during nap time, but getting up to play is so much more fun. She has been instructed not to push food off her plate when she is full, but it is a battle at every meal. Self-control is the root from which all other moral behaviors grow. When my daughter, Beckie, was two, Sandra was pregnant, so we decided to move her out of the crib into the toddler bed so the crib would be available when little sister (Megan) was born. Beckie didn’t want to stay in her bed. So she got up. Over and over and over and over again. And each time she received a spanking. Over and over and over again. I hated that. I prayed that she would stay in bed. I cried as I spanked her. But we held our ground. And eventually it paid off. She learned not to get out of her bed at night. And she never did again. But this was about much more than just staying in bed, it was about self-control verses self-gratification. We all have a “self-control” muscle that, like our other muscles, when exercised becomes stronger. When we stand our ground and insist that our kids obey us when they are young, we strengthen their self-control muscle. What an amazing gift we can give to our children as we prepare them for adolescence! Think how important that will be later on when the temptations they face are much more dangerous than getting out of bed! Next time: we look at one of the greatest barriers in teaching our children self-control. Accept your right and responsibility to train your children. The parents have been given the responsibility to train, care and provide for a household. With that comes the authority to determine and enforce the principles that will be lived out in the home. Be confident in your authority. Parents should not feel guilty for directing or disciplining their children. If your child doesn’t like you once in a while, that’s okay! Don’t make being a buddy such a high priority that you can’t be an effective leader. Deep down, children desire consistent boundaries, they provide security. If children are taught a moral code they have it to come back to if they ever stray, but if the moral code was never taught and enforced, then they have no moral code to return to. 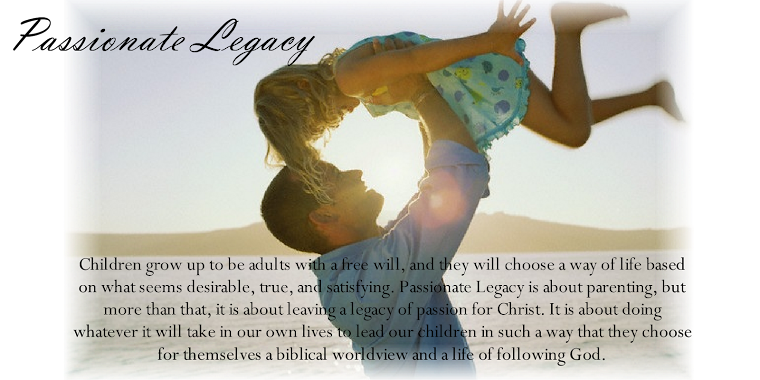 This is the second brick in the foundation of Passionate Legacy, and it is essential if we are to leave a legacy of passion for Christ. Also, remember the first principle: Be a desirable example of godliness so that your children will choose it for themselves. These foundational principles relate to our identity and from this flows our actions in raising strong kids.